All EF, AF and NF series spring return actuators, and FSAF and FSAFB fire and smoke actuators, have a detachable manual override crank tool that fits into a hex slot on the front of the actuator. Use the lock switch to hold the actuator position after cranking, or in the case of the FSAF reverse the crank 1/4 turn to lock the position. To release, apply voltage or wind slightly more until the lock disengages. Non-spring return actuators have a manual override button on the side. Press the button to disengage the gearbox and manually position the actuator, release button to set the position. 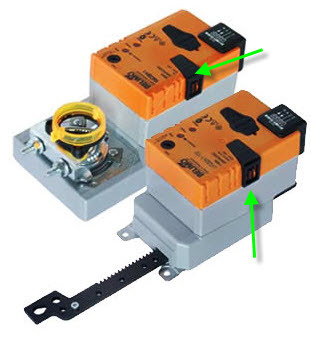 Apply voltage to return to electrical actuation. 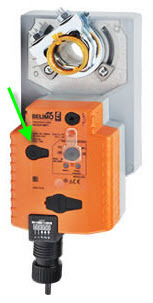 Electronic fail-safe actuators have an override button that operates similarly to the non-spring returns actuator.